Happy New Year and welcome to 2013! I'm joining in with the OWH Stars and Stamps blog with the past year's "ten best." 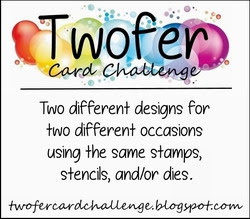 I'm sharing some of what I consider my 10 best OWH cards of 2012. First up is this CAS card with smiley faces on stars that makes me happy, and hopefully it brought smiles to others too. Here's a masculine card I made for dear old Dad. I find masculine cards easier to make than frilly ones, so with all the hexagons, cogs and gears, this one seemed perfect for someone's dad. I tried paper weaving on this card and was quite pleased with the outcome. This card took a little time and patience to create, but those linked hearts (negative portions of a die cut) just made me happy, and I really like the color combination too. This scene immediately puts me into a calm state of mind, and it's one of my favorite stamp sets in my collection. 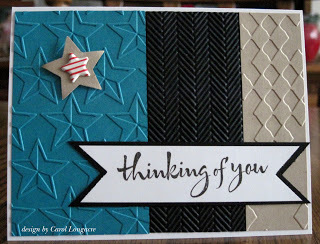 I try to make lots of "thinking of you" cards for our heroes that use leftover pieces of dsp, so this design is perfect for them. 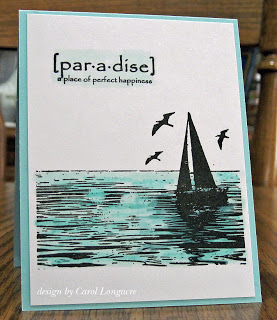 I use an assortment of colors and embossing folders to add texture and different looks. The larger bold sentiments work perfectly with this design. Another one of my favorites for Dad. 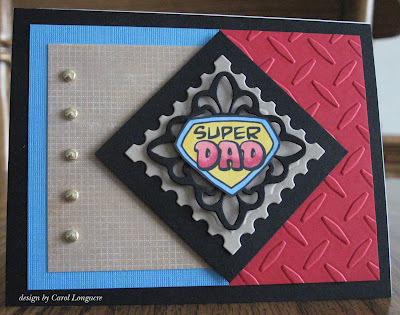 I like the combination of diamond-plate embossing, and the colors associated with Superman. This is one of Sandy's earlier OWH digi images I've had for a long time, but it's still one of my favorites for kid's cards. I did a little paper piecing for this one, adding a shred of cardstock that I curled around a toothpick to look like a little streamer. 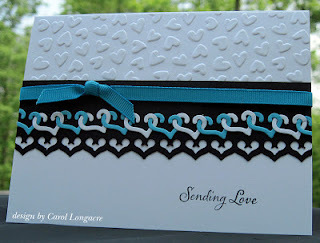 This might be one of the easiest cards I've ever made, but it's a great way to use up that beautiful ribbon you have lying around. I think the sentiment is perfect for our heroes to send home to loved ones. My final favorite is this cowboy riding off into the sunset. I just love how this card turned out, and the sentiment indicates what our heroes are all about. 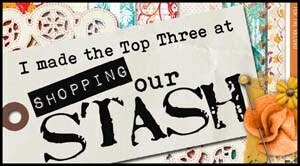 I hope you've enjoyed my look back at some cards from 2012 and I look forward to seeing your ten best too! Love them all! You are great at masculine cards... Color me jealous!! Carol...Great group of cards...the first remind me of my nephew that was nicknamed smiley by friends. I do not remember the boat card...love the coloring...so serene. The textures on the Thinking of You abolutely ROCK! Cannot wait to see what you do in 2013.
thanx for this wonderful eye-candy! one can see how incredibly gifted you are, sweetie! wishing you a blessed 2013! Love all these cards -- so much so that it's tough to pick a favorite. I'm especially drawn to your use of textures and those little details, like the streamer made from curled cardstock. Carol, I have no idea how you picked 10 favorite cards. It's a good thing I didn't have to pick for you because I love each and every one of the cards that you've showcased for us this past year. Thanks for my daily shot of inspiration, although sometimes that inspiration doesn't talk to my MoJo. We keep trying and plugging along. 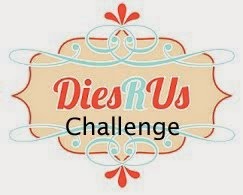 We need to for our heroes. Happy New Year my sweet friend. ALL are so wonderful!!! I DO love that last one those - gorgeous!! 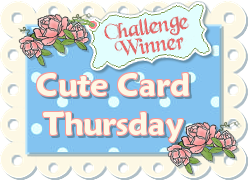 Carol I enjoyed seeing your top ten cards, they are beautiful! 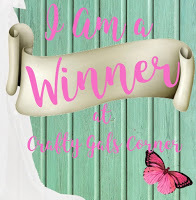 I always love visiting your blog and being inspired by your beautiful work. Carol, I can always count on you to share some terrific cards! Thank you for the inspiration for 2012. Happy New Year! I love them all. They are all so different, yet eah is so special and well done. Great cards! Do not ask me to pick a favorite. These are all so fabulous! I like the puppy with the streamer curls, great coloring and ideas! Wonderful cards! I love the little card stock streamer. Your paper weaving is terrific. Hi Carol! I enjoyed looking at each of your card and studying the beautiful and challenging techniques and details. I remember and love that little squiggle of "confetti"! The artistry of your "Born Free" card speaks for itself. Happy New Year, Carol! Great cards Carol!! 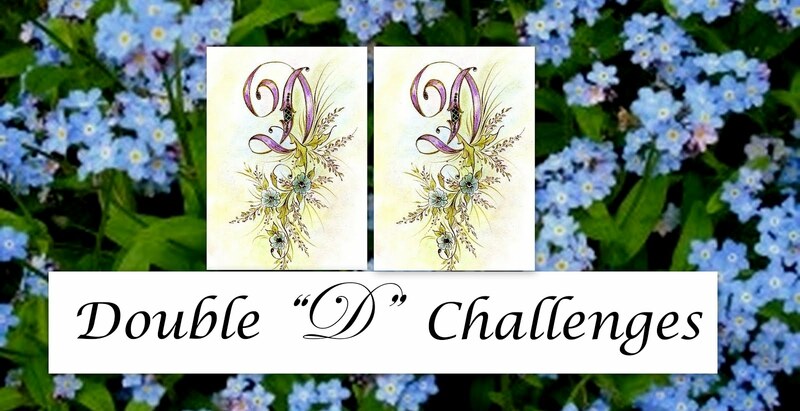 You are fabulous at masculine cards! Thanks for the inspiration! Happy New Year Carol! 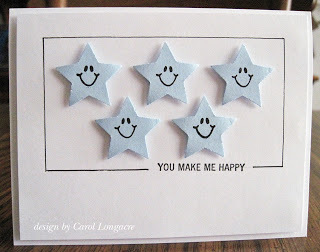 I love the card with the smiley stars. You have a great collection from last year. Happy New Year! All of your cards are beautiful, but I especially admire your masculine cards. These are just wonderful! So many ideas. The entwined hearts are amazing - and I love the piecing on the puppy's hat that matches the paper in the background. And that ribbon card, yummmmmm! Thanks for the inspiration -and all your support for our heroes! Happy New Year! I love them all, they're sooooo gorgeous. 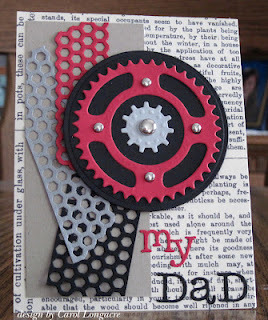 But my favorite...the gears for dear old Dad! It's shear perfection! 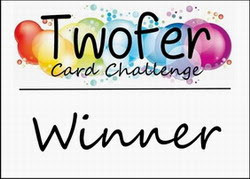 Carol, such a wonderful collection of cards 2012 is yours. Every card is so touching as you described. 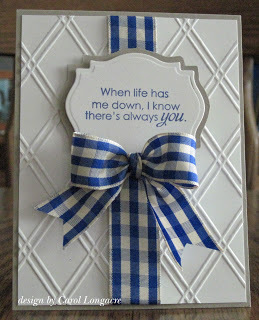 I love the sentiment "When life has me down, I know there's always you." Thanks for your inspiration. Great cards!! TFS - That cowboy is awesome!! Super selection of cards, Carol! 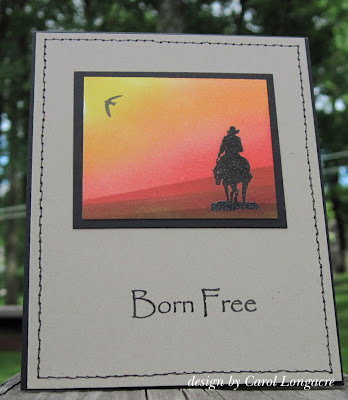 I just love the smiley faces on the first and the Born Free card is a-w-e-s-o-m-e! All in between are just great, too. 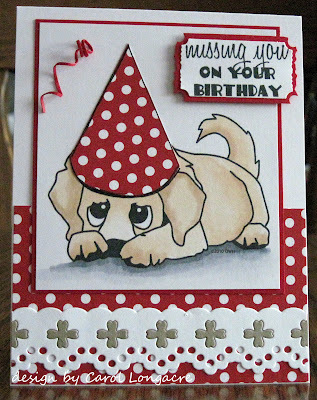 You had a great year of cardmaking. Love the background on the cowboy - I need to try that technique! These are ALL amazing! I love all the dimension and textures. And the pieced heart chain is brilliant! Happy New Year! Nice cards...I like that you use different colors, patterns, textures. Beautiful selection of cards. Just love them all. I can tell you really put a lot of thought and time into these. I'm sure they were chosen quickly to be sent home. 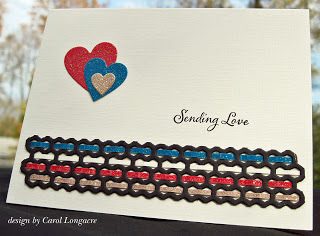 Love your cards, Carol! My favorite is those smiling stars. They make me smile! Happy New Year! Thanks for all of you help and inspiration through out this last year. I have grown so much from watching you create. These are each a true gift. What a lineup, Carol! This is a wonderful set of cards to represent your 2012! I love those chained hearts too and you really do have a knack for masculine themes (I don't lol). TFS and Happy New Year! So many fantastic cards-- love those stars though! Super cute! 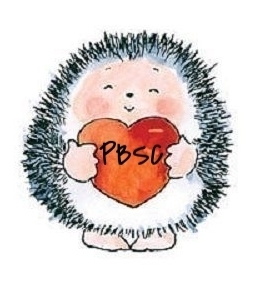 Every card is beuatiful- for so many different reasons- the smiling stars is so cheerful and Born Free is stunning- and boy- do you have masculine cards down prefectly! 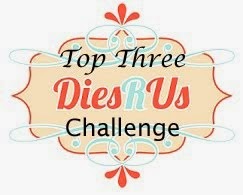 I am so stealing-oops- I mean- borrowing- a bunch of your ideas! Thanks so much for your inspiration! Hi Carol! Love, love all of your cards. I don't recall seeing the sailboat card - it's really lovely. I always enjoy visiting your blog (as you know, lol!). I always get so inspired by your cards, especially your use of borders and little finishing elements. Have a super New Year! Wow! I love all the textures and techniques you used. That paper weaving is gorgeous. What a fun and diverse group of creations mzzz Carol! 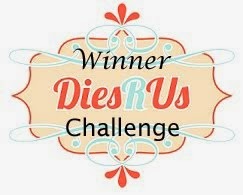 Very fun post! Hi Carol! I love 'em all! The smile stars are just precious and the interwoven hearts are astounding! Thank you for sharing and for so many encouraging comments on my blog this past year. Happy 2013! I wish you a ☆ :: * Happy-New-Year * :: ☆ From Japan. Ryoma Sakamoto. All of your cards are fantastic, Carol! My favorite is the one with the linked hearts! I love the color combo as well!! Nice job on all of them! I'm excited to see what 2013 brings! Happy New Year, Carol!! Great set of cards! I want to try the paper weaving - that looks so awesome! All of them are fabulous! 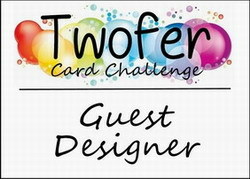 TFS I made many cards, but i haven't post 10 on my blog. I'll try to do better this year. Have a blessed New Year. love the embossing you did! adds so much to your cards!! What a fantastic collection! I love this! But I do hate it when I see an embossing folder that I do not own. Dang it!!! Dang it!!! The tiny years must be mine!!! Beautiful cards... Thanks for sharing! I love "top ten" posts like these! Your ten cards all use different techniques & different themes, but they all bring a smile to my face. And I'm positive that they made their recipients smile too! Absolutely beautiful! I found myself looking at the intricate borders and wondering who made those! AND the linked hearts - well - those were just amazing! What a fantastic selection of cards! The smiling stars are just too, too adorable. 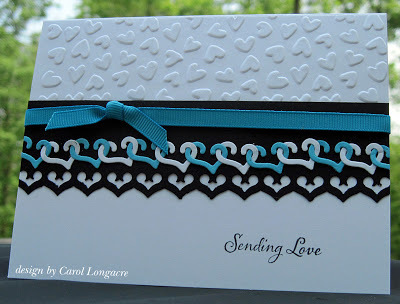 The "sending love" sentiment that you used on a few of these is great for OWH cards. The Ciara birthday card is darling, and I like how you paper pieced her party hat to match the background paper. And the blue gingham bow is simply perfect. Keep up the fantastic work - I always enjoy seeing what you create! Wow, Carol, what a super bunch of cards. I'm intrigued by those linking hearts and love the wonderful use of texture on so many of your fab creations. TFS!